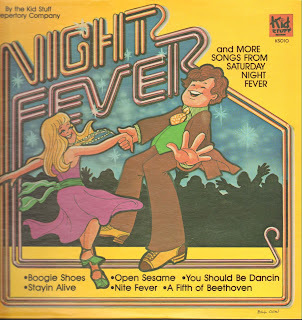 Here's some songs from "Saturday Night Fever" presented by those guys from the Kid Stuff Repertory Company. It's not too bad for a bunch of studio guys I guess, but I don't think these are the same people who do the children's stories! I figured this would be a good one for the day before Christmas. This isn't the actual poem "A Visit from St. Nicholas" but a dramatization of it. This also has the story of the little fir tree who wanted to see the world, as well as the story of the Nativity from the animals' point of view. It says on the liner notes that "The Night the Animals Talked" is a "new and very beautiful story", but I could have sworn I'd heard this story before. Could this have been the first presentation of it? 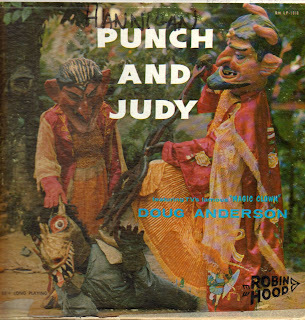 Anyway, this album features stories performed by voices that will probably sound quite familiar to you (even if the names aren't household words) : Peter Fernandez, Jack Grimes, Jackson Beck and others done in "Stereo Motion", designed to "bring your child into the story". I hope you all enjoy this, and have a very Merry Christmas! Wow. 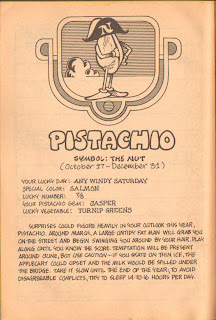 I don't know what to say about this, other than it makes Frank di Silvestro sound like Lennon & McCartney by comparison! Almost all of these songs are written by Mrs. Nellie Bond who, according to the liner notes, Dinkins met while performing on the Squeaking Deacon Show. They wanted to do an album of all new Christmas songs, and this is what they came up with. I think this might have been shared elsewhere, but I scored a sealed copy of this album so I felt like I should share this clean copy of it. This is just mind-numbingly bizarre, but it's definitely interesting! I hope somebody can give me more information on this album. 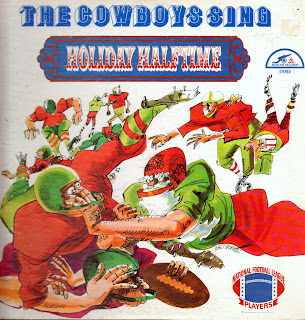 The title, as you can see, is called "The Cowboys Sing Holiday Halftime". That's because it features the Dallas Cowboys football team singing Christmas songs. 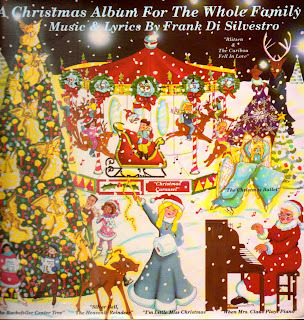 As I did more research, I found that there are other Christmas albums available with other football teams singing Christmas songs. The covers look exactly the same except for the change in title. What I'm wondering is, did they actually get each team to sing, record, and release their own album, or did they just get a huge group of football players to record one album and release it with the different names? Another interesting thing is that in the song "Let It Snow" there's a solo by Lance Rentzel, who I believe played for the Cowboys when this album was released. If these songs were all done with one big group of guys, did they pick a member of each team to sing the solo in that song and put it on the appropriate team's album? Anyway, I hope you enjoy this, no matter what team you like! 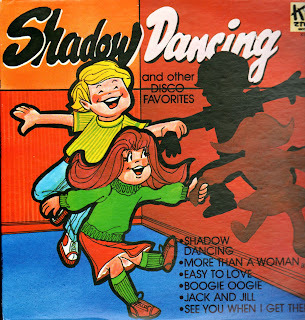 One way I'm sort of fudging on putting other records in with my Christmas ones is by saying that this album involves a toy that many little girls probably got for Christmas. Does that count? 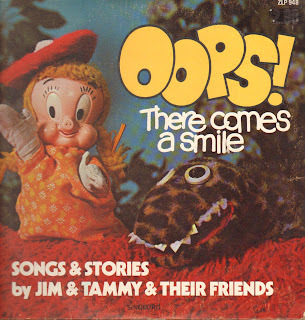 This is an odd little album that involves a doll named Heidi visiting a lot of different fairy tale characters, and even though these are all characters that kids have grown to know, the stories still seem to revolve around the fast-talking Heidi and the Jeep she drives. In fact, for extra giggles, every time she mentions her Jeep, say "Sold separately" afterwards (like they always to on the commercials). You'll say it a lot! The back of the album shows pictures of some of the other accessories you can get for Heidi to help make her life complete. Somehow, captioning the bathroom set with the sentence "Oodles of boudoir glamour for little girls!" just sort of creeps me out. 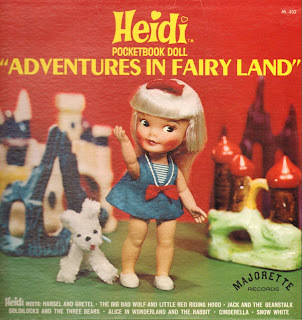 Anyway, enjoy these delightful adventures of Heidi the Pocketbook Doll and her Jeep (sold separately). UPDATE: If you want a literal dose of Heidi the Pocketbook Doll and Christmas, than you can get a copy of Heidi's "The Night Before Christmas" album here at Ernie (Not Bert)! Here's Boris Karloff narrating one of your favorite Christmas stories that was later turned into a cool animated special and a not nearly so good live-action remake! No, not the Grinch. (We've already got Zero Mostel doing that one.) 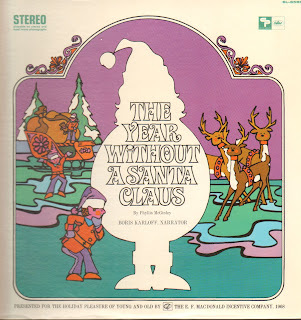 This is the story of "The Year Without a Santa Claus" which, I must admit, I didn't realize was a story before the animated version came out. You may be disappointed to find out that, even though the basic story is the same, the stop-motion animated special we know and love added quite a bit to the story. There's no Heat Miser or Snow Miser here, no Jingle or Jangle the Elf, no Mother Nature, not even Mrs. Claus. The only characters I think the two have in common are Santa and the little boy named Ignatius Thistlewhite. 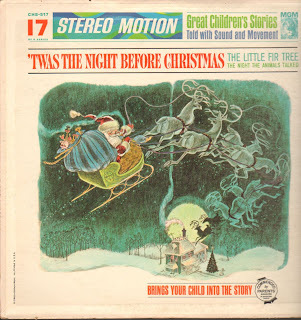 This also features some other Christmas songs by a number of different artists, but the best part is hearing Karloff's dulcet tones telling us another Christmas story. 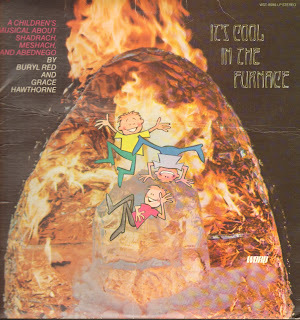 The bottom of the cover states that this is "Presented for the holiday pleasure of young and old by the E.F. MacDonald Incentive Company, 1968". I don't know if that means it was a special giveaway or what. I'd never heard of this album myself until a few months ago. I was looking around online for more info, when I found that Max at "Drunken Severed Head" had featured this album on his blog last year. He has some great background information about the story and the album and, with his kind permission, he's allowed me to link you up to it here. His link to the album no longer works though, so I in turn gave him permission to link over here to me! Isn't the Internet swell? Thanks, Max! NOTE: This has now been released on CD (with different songs included). You can get it by clicking the link below! Hi! Sorry about the delay in getting something new on here. (Again.) I'm afraid I don't have enough Christmas albums to get me through the month, even starting now. So I'll sprinkle a few Christmasy things along with some other stuff. 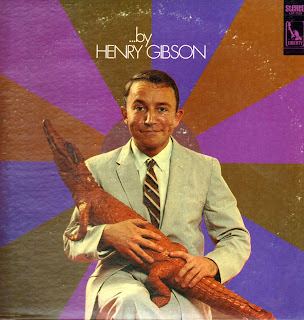 This is sort of an unusual album. I bought it (still sealed) at Goodwill for a quarter. That cover is just all over the map, isn't it? The songs on this album are all composed by Frank Di Silvestro, and sung by two young ladies and a girl who solo on the different songs. The music itself sounds all synthesized. And the songs...well, the songs just don't sound quite right to me. It's not the performances; they're all fine. I think it's Frank's writing. Sometimes there's a wonky attempt at a rhyme. Often a line will have three or four extra syllables so it doesn't quite scan right. Give it a listen and see what you think. All three singers list a number of generic credits (performing in commercials and/or soaps), but Meg Bussert actually has a pretty decent resume. She's performed on Broadway in "Camelot" with Richard Harris, among other things. And she's now a full-time Professor at NYU, teaching Acting and Theatre Studies. I would certainly call her the best one on this album, even managing to pull off different sounding vocals on "I'm Little Miss Christmas". 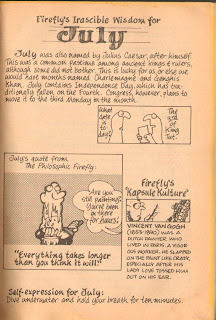 Meanwhile, the most interesting thing I've found that Frank Di Silvestro has done is write a book called "Boy Jesus and His Dog". 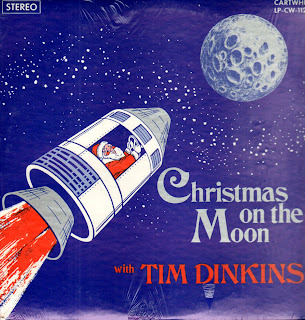 Anywho, I've got a few more Christmas albums coming soon in the mix, so enjoy this! Selma Rich Brody strikes again! 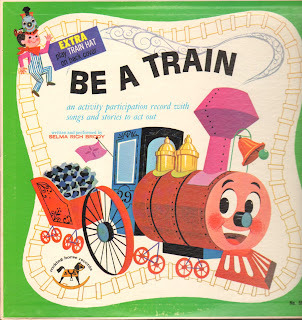 Here's a fun album that's all about pretending you're a train, and the different adventures you can have. On the back of the album cover (and included with this download) is a train hat you can cut out and wear, if you need a bit more motivation (or loco-motivation if you will). Anyway, hope you enjoy this! 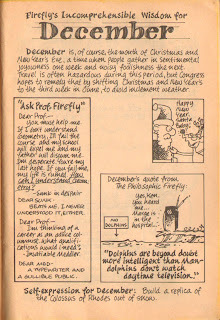 Here's your Prof. Otis G. Firefly wisdom for December, right on time (because I'm putting it in in August)! Enjoy!! 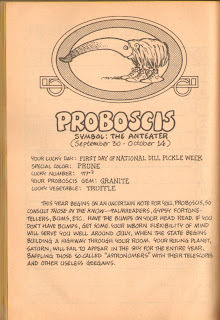 This concludes the monthly words of wisdom from "Prof. Otis G. Firefly's Phantasmagoric Almanac". I hope you all enjoyed it! I'll try to think of something else for a running gag for next year. This is another case of a comedian making an album that gets re-released after they get popular years later. Gibson, in case you don't recall, hit it big on "Rowan & Martin's Laugh-In", best known for the funny poems he would recite. He does a lot of that here too, but I think here he seems more like a charming (if slightly odd) young country boy. It's still a pretty interesting album to listen to though. Hope you like it! I like this one a lot, even though it's a Popeye album without Popeye on it! 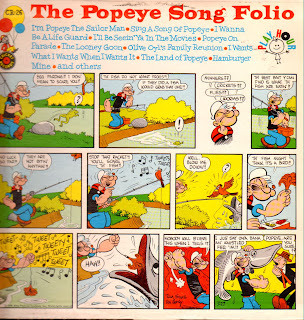 This album from 1959 apparently features songs from old Popeye cartoons, as performed by Captain Paul and the Seafaring Band. Was Captain Paul a children's host that showed Popeye cartoons on his show? I don't know myself, but one of you guys might be able to answer that. I kind of wish they would have sprung for the expense of an actual cover, instead of simply reprinting what I assume is a Popeye Sunday strip from the year before. 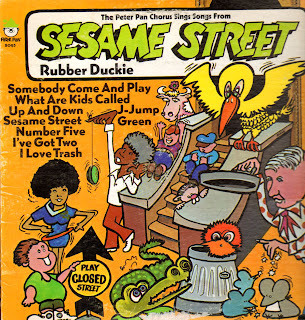 I think (like "Yours Truly" says on the back cover) that one of my favorites is the song "I Wanna Be a Life Guard", but there's a lot of fun stuff on here (even if Popeye isn't singing it). 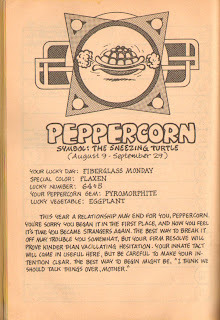 BONUS: And now, straight from the Internet Archive, here's the Popeye cartoon that features the song "I Wanna Be A Life Guard" called, oddly enough, "I Wanna Be a Life Guard"
As for the songs themselves, this sounds like another patchwork job of songs from numerous sources. I like this version of "Sidewalks of New York" sung by kids that are really belting it out. I also have this exact same version of "You're a Good Man, Charlie Brown" on another album (that just has songs from that show) that I'll probably dig up eventually. Anyway, take a listen. I think you'll enjoy this one! 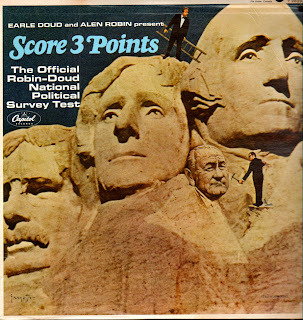 This being Election Day in the US I had to throw one more political oriented album on here. This is Alison Arngrim (probably best known for playing Nellie Oleson on "Little House on the Prairie") portraying then First Daughter Amy Carter. It's pretty crazy, and I hope you like it, and don't forget to vote!! Click heeere or heeere to download! 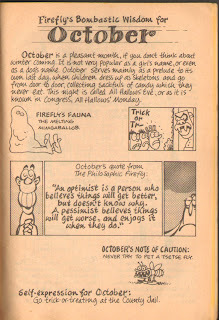 Here's your Prof. Otis G. Firefly wisdom for November, right on time (because I'm putting it in in August)! Enjoy!! A Show You Should Have Been Watching: "The Middleman"
On ABC Family's website you can even watch an episode (Go to Shows/The Middleman/Full Episodes). I think you can watch the season finale there. Alternate realities! Good guys gone bad! Goatees!! Unfortunately, rather than make more episodes available as streaming videos on the website, they sell past episodes on iTunes. (Thanks, ABC Family.) As I said, this is just a fun show that really deserves a chance. Maybe it'll be back next season. I'll keep my fingers crossed. Let's throw another political album into the ring here. 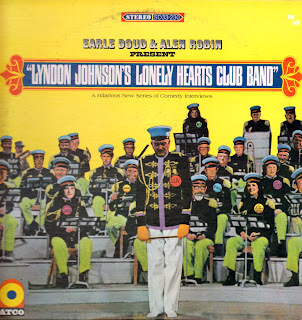 This one is done by the same people that brought you "Welcome to the LBJ Ranch" and "Lyndon Johnson's Lonely Heart's Club Band", and follows the same format of taking actual recorded interviews and putting humorous content around it. I don't think it works quite as well this time. Maybe you just need to be more aware of (what were then) current events. Hopefully you'll get some enjoyment out of it! Section 4: What Do You Hear? Section 7: What Were They Doing When They Said It? Section 9: What Do You Hear? I thought the re-release of this was the same recording as this one, but it turns out it was totally redone, so here's the original deal. A great, fun Christian musical with some catchy tunes. Enjoy! 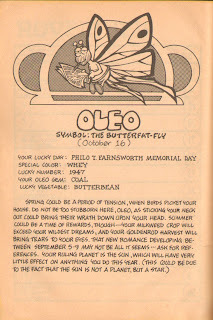 Here's where you fall in the Prof. Otis G. Firefly Zodiac if you were born from Aug. 9th through Sept. 29th. Yeah, they're getting pretty strange here, but there you go! 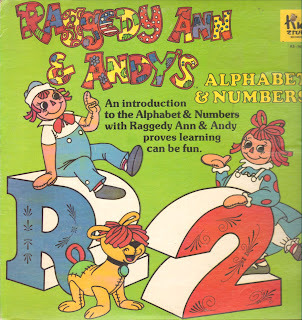 Here's another album of Romper Room songs, and even though it's certified with Mister Do-Bee and Happy Jack the Jack-in-the-box, I still don't remember any of these songs. 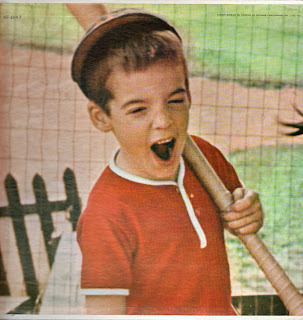 Where's the Do-Bee song ("Do-Bee a car sitter, Don't be a car stander") or the Punch-a-Ball song? I don't know. There's gotta be an album of those songs, but this one ain't it. 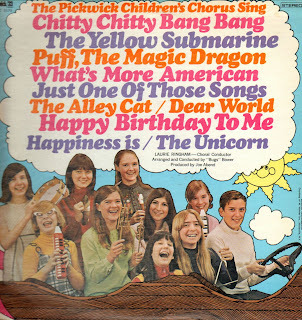 There's still some nice kids' songs on here though. Hope you like it. 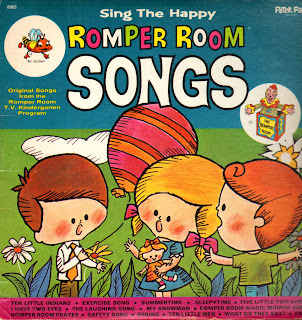 UPDATE: For an album with more of the traditional Romper Room songs, it's available in mp3 format from Amazon.com! You can get it here. 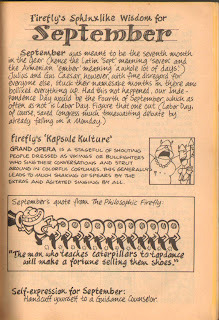 Here's your Prof. Otis G. Firefly Wisdom for August, and only a couple of days late! Enjoy!! I'm looking for a copy of a record I had many years ago. It was the size of a 45 (with the large hole in the middle) but I think it played at 78 speed. It had a blue label (was probably an older Golden Record). He just knocks me out! Just makes my love for him grow. It’s the conk that means he cares. It means more than flowers or candy. We’re happy in the mountains. And we like our home just the way that it is. Gonna get us a house with a bell on the door! Even if I found my copy of it it's so worn out I'd be hard pressed to get a good recording of it. If anybody knows where I could find this, please let me know. Thanks! Here's another unusual mash-up of sorts. 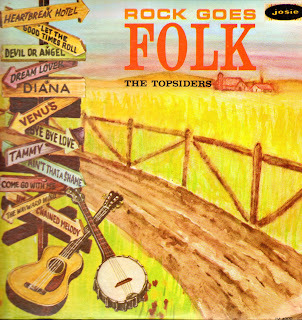 The Topsiders took what were popular songs at the time and reimagined them as traditional folk songs. Does it work? I don't know. It almost sounds like they knew a few chords and were bound and determined to make each song have only those chords in it, whether they really fit or not. It's an interesting experiment though. The Peter Pan Chorus takes a stab at some classic songs from Sesame Street. I think they're better off when they just sing the songs normally. When they try to do funny voices it doesn't work as well. Take a listen and see what you think! I thought this would be a good one to put up to tie in with the opening of "The Dark Knight". I went record shopping a couple of months ago and scored a sealed copy of this. 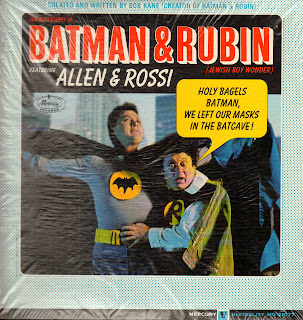 Marty Allen and Steve Rossi were a popular comedy duo at the time, and this is the story of a comic book reading boy named Rubin (Allen), and his dream of joining Batman and battling the Penguin, the Catwoman, and the Riddler. I know a lot of you are going to want to know if this album is funny. To be honest, I didn't get many laughs from it. (Maybe if you're Jewish some of the references might be funnier.) But regardless of that, I thought it would be good to put up for the historical significance of it. Enjoy! 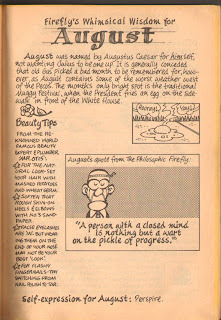 Here's your words of wisdom for July, courtesy of Prof. Otis G. Firefly. Enjoy! 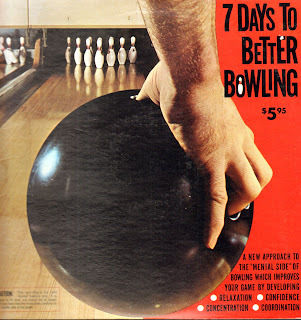 Here's one of those self-hypnosis type records; this one is supposed to make you a better bowler. You're supposed to listen to Side 1 during the day and Side 2 at night. I was going to try it myself, but there's a big caution on the front stating that this record is "for right handed bowlers only". I'm a leftie myself, so I don't know what effect they think it'll have on me. Maybe they think it'll turn me into some sort of robotic killing machine. Or maybe it'll just make me bowl screwy. Who knows? Frankly, I'm not willing to take that chance. I was going to lump the few political records I found together around November, but it really is a mixed bag. I like this one though. This is actually a sequel to "Welcome to the L.B.J. Ranch" that I have featured here put together by the same people, and the concept is the same as well. The commentators ask questions and the politicians provide answers that are actually taken from other interviews and recordings of them with humorous results. I enjoy this because you don't even have to really know much about the politicians to laugh at the jokes, but it's probably funnier if you do know about them. Anyway, I think you'll like this one! 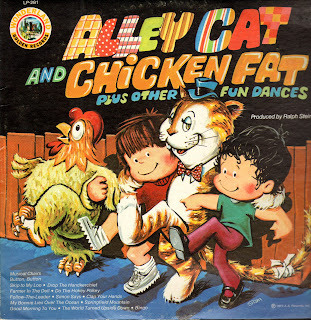 Here's a record of games and dances for kids. I seem to remember having a pretty old 45 with this version of "Drop the Handkerchief" and "Button Button", so this could be another compilation of songs from various sources. Anyway, some neat stuff here, and I hope you like it! 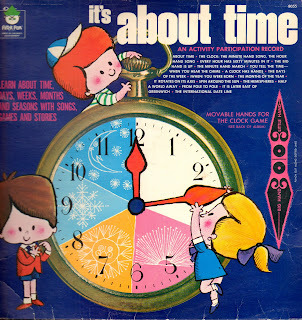 Here's an interesting children's record talking about all aspects of time. It starts simply talking about the minute hand and the hour hand of the clock, then getting into days of the week and months of the year. By the time it's all said and done, they even get into Greenwich Mean Time and the International Date Line! 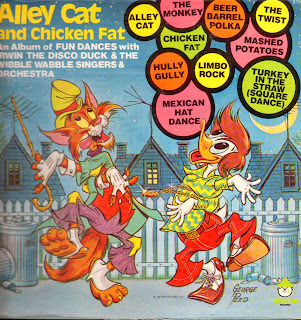 Pretty heady stuff for a kid's record, don't you think? In comparison with the previous album posted here, here's some kids that just sound like they're having fun singing their lungs out! It's kind of a strange album cover though. Why is there one boy in the front driving and nine girls in the back? And why do I feel like the girl at the bottom left with the cat's eye glasses is staring into my soul? Anyhow, hope you enjoy this fun album! 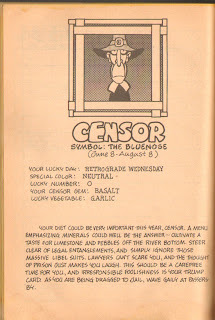 Well, it looks like most of you with summer birthdays are stuck under the sign of Censor the Bluenose (at least according to Prof. Otis G. Firefly)! 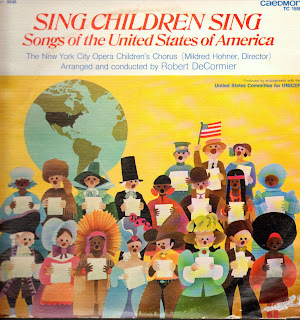 As you might expect, this being the New York City Opera Children's Chorus, you're not going to get any crazy renditions of songs here (although it is sort of odd to hear songs like "Go Tell Aunt Rhody" sung so reverently). Enjoy! 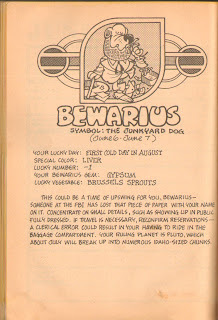 The Prof. Otis G. Firefly Zodiac continues with Bewarius the Junkyard Dog. Not too many of you will fall under this sign, considering it only lasts for two days! Sorry this is late. I forgot to put it in the scheduled posts. 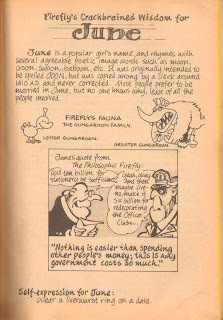 Here's your Prof. Otis G. Firefly wisdom for June. Enjoy! 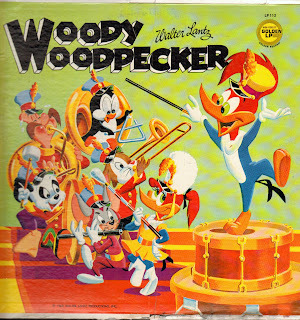 There is a little bit of overlap from this album, but unlike that one, this one does use the voice of Woody Woodpecker from that time, Grace Stafford (who also happened to be producer Walter Lantz's wife). This one throws in a slightly different mix of characters than the other one. 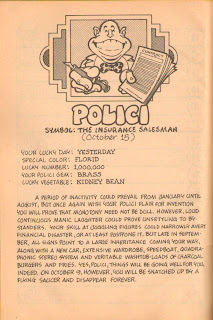 There's still Woody of course, as well as Andy Panda (Yes, his song is actually called "The Andy Pandy Polka") and Chilly Willy (who they gave a goofy voice for his song), but there's also Inspector Willoughby, the Bearies, and Space Mouse. The only place I ever remembered seeing Space Mouse is on a domino set I had when I was a kid. It was one of those that used pictures instead of dots, and he was one of the pictures. Anyway, there's lots of fun stuff here, and I hope you like it! 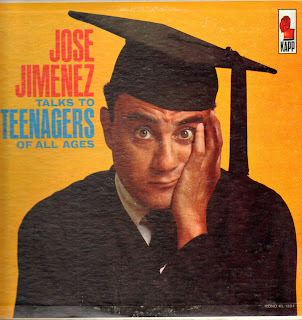 I know a number of high schoolers will be graduating this weekend, so here's a special album for you, performed by Bill Dana's alter-ego, Jose Jimenez, in front of a live studio audience. If afraid to tell you guys that I think this is pretty funny and risk a repeat of the Paul Lynde debacle we had earlier. 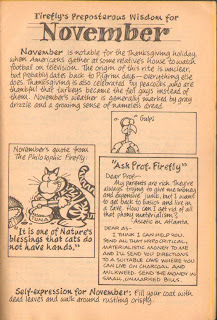 I do particularly enjoy "The Etiquette Expert" because it sounds like a fun ad-libbed Q&A with young audience members. Anyway, I hope you enjoy this and Congratulations Graduates!